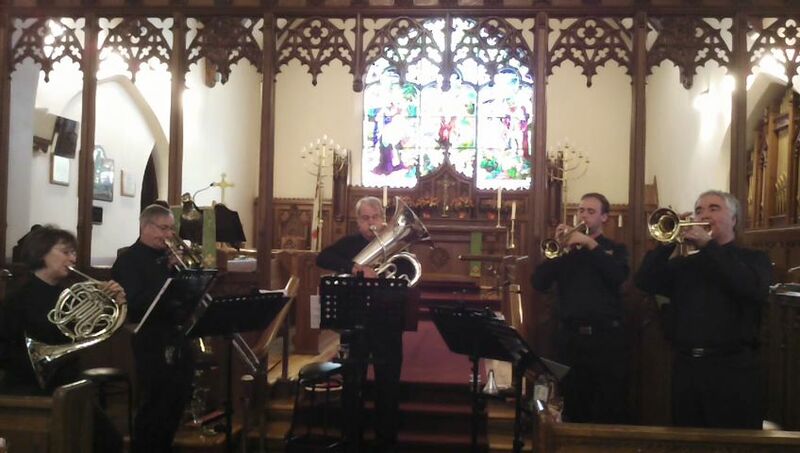 On Sunday afternoon , October 23, Manotick Brass performed a joint fund-raising concert with Holy Trinity Anglican Church in Pembroke, Ontario. The concert was billed as ‘spreading a little sunshine’ and the program contained several numbers which helped brighten the day. The opening number “Let the Sunshine In” – an arrangement of an old gospel song in traditional New Orleans style, set the scene for a sunny afternoon. The program also included a swinging arrangement of “Shine, Jesus, Shine” and a foot tapping arrangement of “Brighten the Corner”. Also participating in the program was the Holy Trinity Anglican Church Choir and The Intermittents, an entertaining group of male gospel singers. 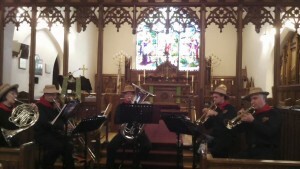 The Manotick Brass was joined by Paula Lundrigan for two arrangements for organ and brass. These were “Nun Danket alle Got by J. S. Bach and a rousing arrangement of the Easter Hymn from the opera “Cavalleria Rusticana”. The concert was well received by the audience with the Manotick Brass playing an encore. Sales of the 2 Manotick Brass CDs were brisk. Listen to There’s No Business Like Show Business recorded during the Pembroke cocert.